Space-saving design with lid opening upward. Programmable auto-start for initiating a cycle up to 1 week later. Dual-sensing lid interlock prevents lid opening when chamber is pressurized or when temperature exceeds 97°C. Automatic air purging by a microprocessor prevents over-pressurization during a cycle. One-touch lever to easily open and close chamber lid. Programmable rate of steam exhaust. Door-closure sensor provides a prompt and the cycle will not start unless the door is closed properly. In-process display shows status and progress of sterilization cycle. Agar sterilization mode for sterilizing agar and then automatically maintaining it at liquid temperature. Unique accessory: Floating sensor to monitor load temperature. 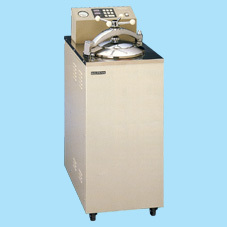 Sterilization timer is activated only when load temperature reaches set temperature. Agar melting mode for rapidly melting agar and maintaining it at liquid temperature, or for a hot and faster start-up. Memory backup system retains user-programmed parameters even in case of power failure. Space-saving design with lid opening upward. Agar sterilization mode for sterilizing agar and then automatically maintaining it at liquid temperature. Dual-sensing lid interlock prevents lid opening when chamber is pressurized or when temperature exceeds 97°C. Agar melting mode for melting agar and maintaining it at liquid temperature, or for a hot, faster start-up. One-touch lever to easily open and close chamber lid. In-process display shows the status and the progress of sterilization cycle. Door-closure sensor provides a prompt and the cycle will not start unless the door is closed properly. HVE-50 size: 50 liters, 11.8" diameter, 28.0" height. 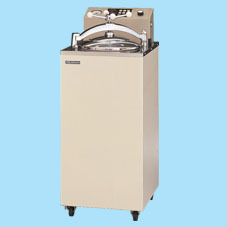 Fully automatic drying using heat and vacuum without the need to open chamber lid. Built-in access port for independent thermosensor and temperature recorder option. 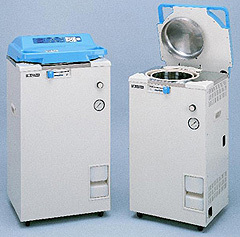 Pre-vacuum cycle completely eliminates cold spots formed by air pockets at initiation of cycle for rapid and optimum sterilization efficiency. Safety features: Over-temperature power cutoff, over-pressure power cutoff, low water power cutoff, and pressure relief valve. Self-contained system without the need for an outside steam source or plumbing for venting. 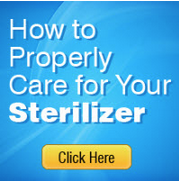 Bacteria filter protects sterilized load from the potential of recontamination. On-board service diagnostics for rapid troubleshooting. HA-300P size: 50 liters, 11.8" diameter, 26.4" height. 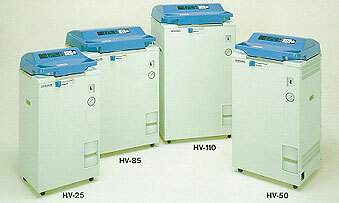 The HVP-50 autoclave, with a 50-L chamber, is a self-contained, portable floor model mounted on caster wheels. It occupies minimum floor space, operates at 120V, and can fit conveniently into many locations in the laboratory. 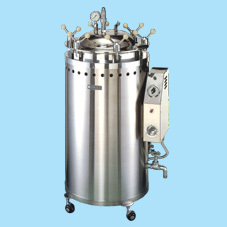 Its many uses include the sterilization and drying of glassware and pipette tips, and the sterilization of wastes and liquids such as agar and media. 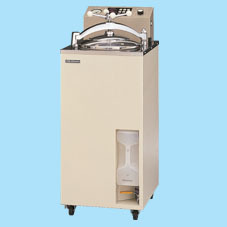 The HVP-50 model can accommodate a 10-L fermenter, a 15-L carboy, a 19” x 24” biohazard bag, six 1-L flasks, twenty-one 500-mL bottles, or one hundred eighty 20-mm test tubes. Space-saving design with lid opening upward. Drying cycle for solid loads uses heat and vacuum for faster and more efficient drying. Lid safety interlock prevents lid opening when a cycle is in progress, the chamber is pressurized, or when the temperature exceeds 97°C. Vacuum pump removes air from the chamber, when sterilizing solids such as glassware and pipette tips, thereby eliminating cold spots, and ensuring faster and more efficient sterilziation. One-touch lever to easily open and close chamber lid. Liquid cycle for media and agar. Process display shows the program progress selected and status of the sterilization cycle. Cycle for wastes and glassware without drying. Door-closure sensor prevents a cycle from starting unless the door is closed properly. HVP-50 size: 50 liters, 11.8" diameter, 28.0" height.